Playlist may contain traces of nuts. AD 2006, Mankind encounters a mysterious Phenomenon called "Algernon". Nothing is known about Algernon, all people involved with Algernon are dead. One day, the mysterious phenomenon Algernon happened at an underground Amusement park where our hero Keita met our heroine Hinoki, driving "Kakuseijin". Keita and Hinoki encounter a lot of mysteries and monsters. What is "Algernon"? And what is "Better man"? Why does Better man help when Hinoki and Keita are in danger? The never ending nightmare has started. 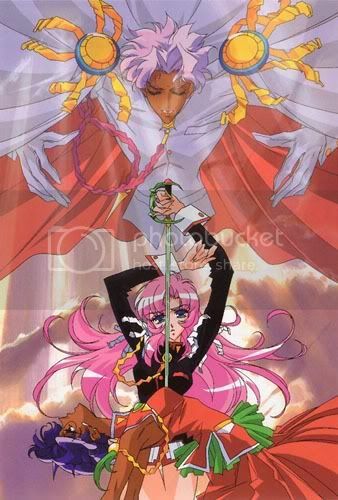 Tenjou Utena's parents died when she was a little girl. At that time, a prince appeared to her and gave her a signet ring with a rose crest. He told Utena to keep the ring and promised that they would meet again someday. Utena was so impressed by him that she decided to become a prince herself! Utena is all grown up now. She studies at the Ootori Academy and wears her own version of the boys' uniform. She still looks forward to finding her prince, but in the meantime, it's up to Utena to save damsels in distress and cross swords with Ootori Academy's top duellists. When Utena unwittingly wins the "Rose Bride" in one such duel, she finds herself in the middle of something else... something that just may lead her to her prince. 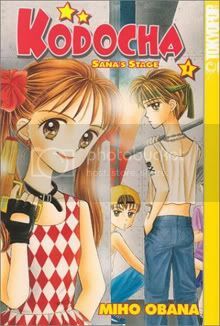 Kurata Sana is a frenetic eleven-year-old child actress with an extremely overprotective agent, a mother who is an eccentric award-winning author, and a burning desire to do well in school. However, as much as she wants to be a good student, the antics of the boys in her class make learning impossible, according to Sana anyway. And in her eyes, Hayama Akito is the worst offender of them all. A junior-high war of the sexes ensues, and Sana eventually realizes through the chaos that Hayama may not be the "devil boy" she's made him up to be. It is a world of fantasy, where magic reigns and monsters lurk, then there's Lina Inverse! A cute, fireball-throwing sorceress who steals from the wicked and gives to herself! 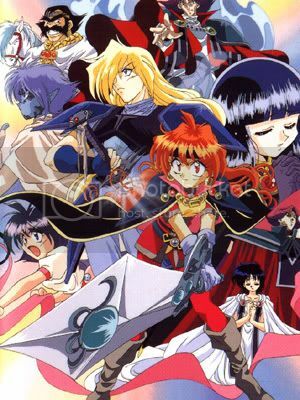 Along with Gourry, a handsome but not-so-smart swordsman, Lina faces the uncanny as she seeks fame and fortune. 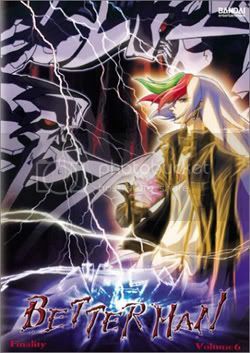 Meanwhile Zelgadis, a powerful soldier pursues Lina in an attempt to recover a magical item that can bring about the end of the world. The first episode opens with the mysterious suicide of a high-school girl, Chisa Yomoda. Chisa-chan was a classmate of Lain Iwakura, a quiet, 14-year-old high-school girl. One of the other girls in the class has been receiving e-mail messages from Chisa-chan, and Lain discovers she also has mail from Chisa-chan. In the mail she explains to Lain that she just abandoned her flesh. She assures Lain that she still is alive in the 'wired' world. After getting a new 'navi' and adding a 'psyche' circuit, Lain spends more and more time in the wired. 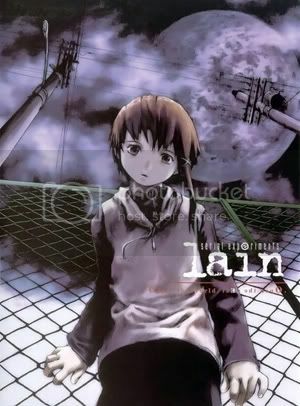 It seems that Lain has at least 2 personalities, and Lain's first personality is changing even now. Who is Lain? Who are the 'knights'? Can the wired influence the real world with a prophecy? Is the real world nothing but a hologram of the information in the wired? Could really make an all day marathon for 95-99. There's that much worth watching from those five years. But three hours is enough. Dhumahn wrote: Playlist may contain traces of nuts. Nah, they're in the audience. aww man where dem robots at? 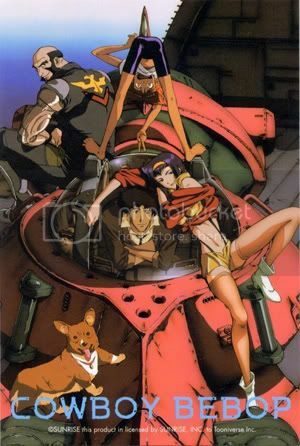 Bowt time I watched Escaflowne and Lain. I second Garrys' observation, where are the robots? Dare you to play Cowboy Bepop dubbed. Also, the plot for Utena seems much more interesting than I'd ever given the show credit for; having not paid it any attention ever. Also, first post in like 2 years because I finally got around to remembering how to log in. Bazza wrote: Dare you to play Cowboy Bepop dubbed. GarryGod wrote: aww man where dem robots at? 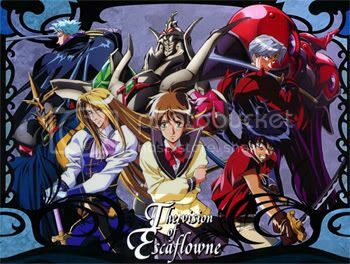 >He thinks Escaflowne's Guymelefs run on steam. >I think greentexting on a forum is a good idea. I seriously hope I don't do this. Again. > implying I've watch it? GarryGod wrote: > implying I've watch it? >Implying you have taste, then. >Oh b.ugger, I've done it again. If we're imitating 4chan can I just start a massive transplant of whatever happens to be lurking in /d/ at this moment in time? Yeah, and it'd probably be something like 2 years before you can post again if you do that. AVCon at OzAsia will hopefully be attracting some newcomers to AJAS over the next few meetings. Responses from the History of Anime (OzAsia remix) panel (which drew more people in than last time and also had more attend than Angel Beats and Summer Wars! ^^), casual chats and inquiries were far more positive this time. So be accomodating to them and make them feel welcome. I.e. Keep the internets to the internets. Don't bring that behaviour to meetings. Dhumahn wrote: are they salted nuts?